The app I'm working on is a little like a set of sub-apps within one app, so the structure is basically as follows. Note that the subsections are a mix of tools and content (i.e. 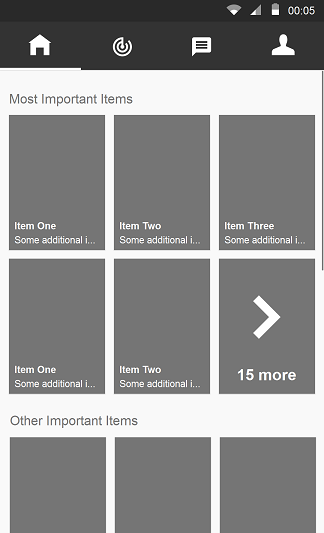 this isn't an app full of content like Google Play that is categorised) - it's functionality too. The subsections are not suitable for side-swiping as some include pinch-zoom on content. A. Home uses the Dashboard pattern, a grid of icons for each of Section 1, 2, 3 etc. I know the suggestion now is to show content on entry, but there is no suitable content in this app to surface so a grid of section icons seems appropriate. 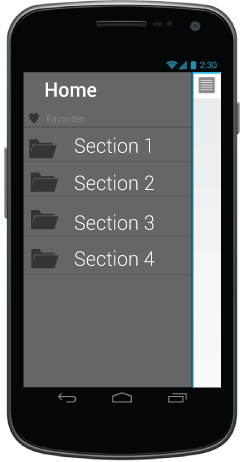 C. Use ActionBar Navigation Tabs to move between subsections A, B, C, etc. However unfortunately it seems the ActionBar supports EITHER spinner drop-down navigation OR navigation tabs, but not both and the client needs the full set of Sections to be visible across the app. They're asking me to put a row of buttons across the bottom of every screen (a la iPhone) and I'm uncomfortable with that as it's an iOS pattern, and doesn't fit well with Android, but they may have a point that relying on Home/Up for people to find the other sections of the app may be asking a lot. That suggests I use the dashboard pattern for the user to pick a Section, then actionbar nav tabs for Subsections, but my concern is the user can't see all the Sections once they're in the app, and it relies on them knowing to tap Home/Up to see the list. Can you see a better way to handle two-level navigation, without resorting to an iOS UI pattern of bottom buttons, and where the Sections are very clear to the user? Like I mentioned in my comment, I'm working on a similar app. IMO, Facebooks' dashboard will work fine for your Sections. The link is available from all screens (subsections) so your requirement "client needs the full set of Sections to be visible across the app" is also fulfilled (more or less). 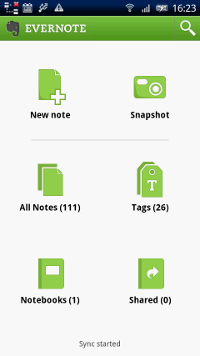 And for your Subsections corresponding to each section you can have Scrollable tabs like in Android Market. (Or even fixed tabs if they're fixed). Question and answers here are old, but the challenges when it comes to some kind of multi level mobile navigation are timeless. 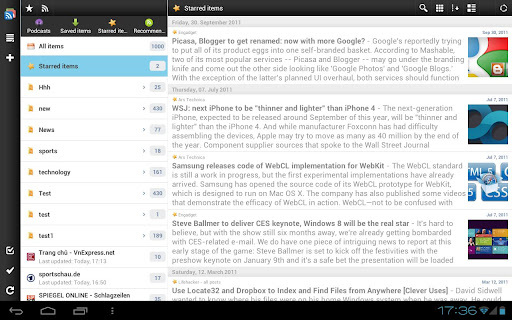 The most obvious choice is the NavigationDrawer (left sliding menu). It’s the prefered pattern if you have really complex and feature rich structure from the beginning. Another scenario is when you are just starting and need the ability to scale fast and easy, to add core features effortless. 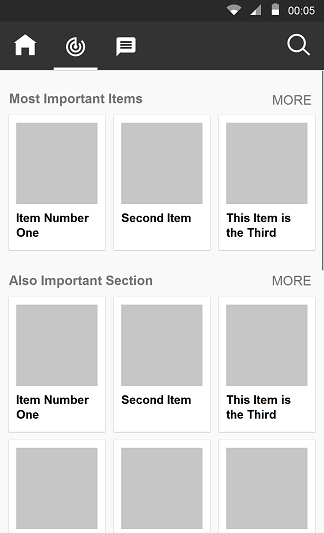 When your base navigation is with a drawer, subcategorization is straightforward since every element from the menu redirects to a standalone screen. IMHO tabs are always better when possible. 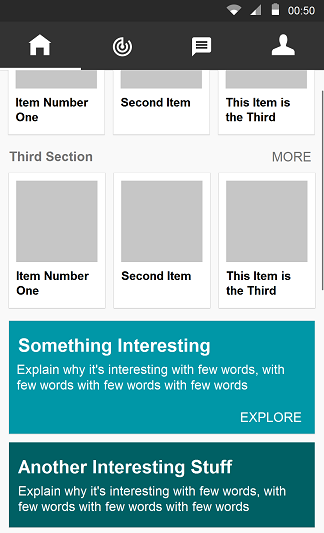 Showing a “demo” of each section with a “show all” action redirecting to dedicated Subsection Screen.This way you provide content rich scrolling experience, and the user has a quick access to what he finds important. This is a great situation to take advantage of multi-pane layouts in ICS. They key thing to keep in mind is that you can't make your application look the same in both landscape & portrait layouts while keeping top-notch usability. 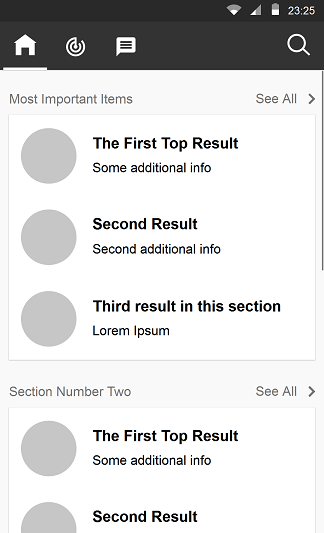 As a result, you can't show both levels of navigation plus the content at all times. Portrait layout is far more limiting. There isn't enough space to show more than 2 levels at once. The solution would be to show Action Bar Tabs on top of the screen with the top level navigation with the list of the second level options under it. When the user taps any of the level 2 items, the content/app is displayed in nearly full-screen mode. 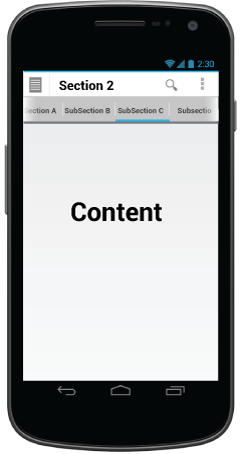 You can also try replacing the content of Action Bar Tabs with the level 2 navigation when viewing the app/content. However, this needs to be user-tested to make sure there isn't any confusion with navigational paradigms. Not the answer you're looking for? 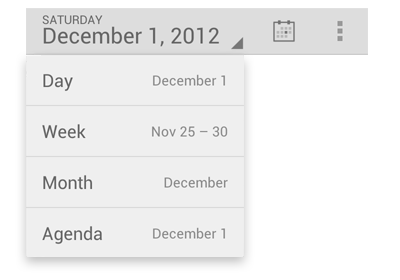 Browse other questions tagged navigation android hierarchy or ask your own question.